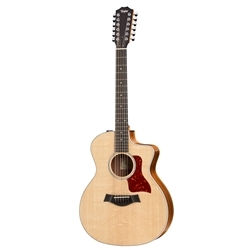 The comfortable body size and musical versatility of Taylor’s Grand Auditorium form the foundation of a great utility 12-string guitar. The 254-ce-DLX features layered rosewood back and sides paired with solid Sitka spruce, and makes a great option for someone looking to add 12-string flavor to their musical toolbox for songwriting or weaving sonic texture into recording or performance. Consistent intonation, playability, sonic focus, and the ability to fit well with other instruments in a mix make it a reliable choice for a working musician, especially with Taylor’s onboard Expression System 2 electronics.